After his success with the hilarious CAT-astrophe, the highly talented Robert Favretto is back with more word tricks. This time his leading character is Justin Credible with his unique nose and its extraordinary abilities. 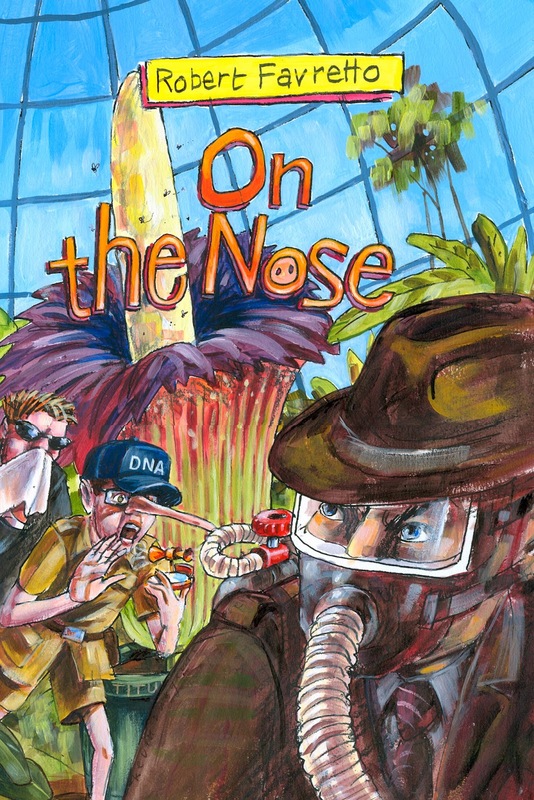 When Justin’s nose (and the rest of him of course) is recruited by the DNA (Department of Nasal Affairs) his life becomes one dramatic adventure after another. Can Justin’s nose sniff out the smelly culprit that has overpowered the city of Aroma? Soaked in humour and nose clichés, and taking outrageous liberties with language, this chapter book for ages 7-10 will have every reader in stitches. It’s ideal for reluctant readers who will turn the pages in delight and anticipation at the next crazy situation. Favretto knows what kids want. Clever, fast-paced, and relentless in its pursuit of olfactory dominance, this highly imaginative, crazy but delicious read was a source of great entertainment to me. Kevin Burgemeestre’s excellent and well-translated illustrations add gusto to Favretto’s quirky style of writing.